For other uses, see Kingston. Kingston SE (formerly Kingston) is a town in the Australian state of South Australia located in the state's south-east coastline on the shores of Lacepede Bay. It is located about 240 kilometres (150 miles) southeast of the state capital of Adelaide and 138 kilometres (86 miles) north-west of the centre of the city of Mount Gambier. At the 2011 census, Kingston SE had a population of 1,425. The town was named after Sir George Strickland Kingston, a South Australian politician, surveyor and architect. Kingston Post Office opened on 9 February 1869. The extension on its name is to distinguish Kingston in the South East (of South Australia) from another 'Kingston' in the state which is now officially named "Kingston On Murray" was added in July 1940. The present-day town of Kingston SE includes the original Kingston, as well as the towns of Port Caroline and Maria Creek. The town was connected to Naracoorte by a 3 ft 6 in (1,067 mm) railway known as the Kingston-Naracoorte railway in 1876, providing a port for the grain and wool grown away from the coast. The rails were converted to broad gauge 5 ft 3 in (1,600 mm) in 1959. The railway closed on 28 November 1987 then was dismantled on 15 September 1991. The region was formerly serviced by two newspapers: the Kingston Weekly, the newspaper of The Kingston Traders' Association, was issued between 22 March 1946 and 30 March 1951. Later, the South-East Kingston Leader was started in Kingston, and was published from 1962 until 21 November 2001 when it was renamed Coastal Leader, and is now a member of Fairfax Media Limited. The main industries are fishing, wine-making, sheep and cattle farming and recreation, the district having a large influx of tourists during holiday periods throughout the year. 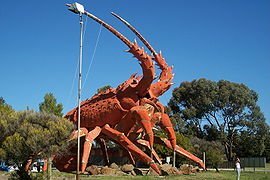 The northern entrance to the town is dominated by the Big Lobster, named "Larry" by people in Kingston. Kingston has a warm-summer Mediterranean climate (Csb). ^ a b c d "Search result for "Kingston SE(Locality Bounded)" (Record no SASA0036846) with the following layers selected – "Suburbs and Localities", "Place names (gazetteer)" and "Development Plan Layers"". Property Location Browser. Government of South Australia. Retrieved 31 August 2016. ^ a b Australian Bureau of Statistics (31 October 2012). "Kingston SE (State Suburb)". 2011 Census QuickStats. Retrieved 22 April 2014. ^ "GEOGRAPHICAL NAMES ACT 1991 Notice to Assign Boundaries and Names to Places (in the District Council of Lacepede)" (PDF). The South Australian Government Gazette. Government of South Australia. 3 December 1998. p. 1711. Retrieved 4 December 2018. ^ a b "Postcode for Kingston SE, South Australia". postcodes-australia.com. Retrieved 31 August 2016. ^ "Kingston SE". Placenames of South Australia. Retrieved 23 December 2016 – via State Library of South Australia. ^ "Cape Jaffa (The Limestone)". Climate statistics for Australian locations. Bureau of Meteorology. April 2014. Retrieved 3 April 2014.